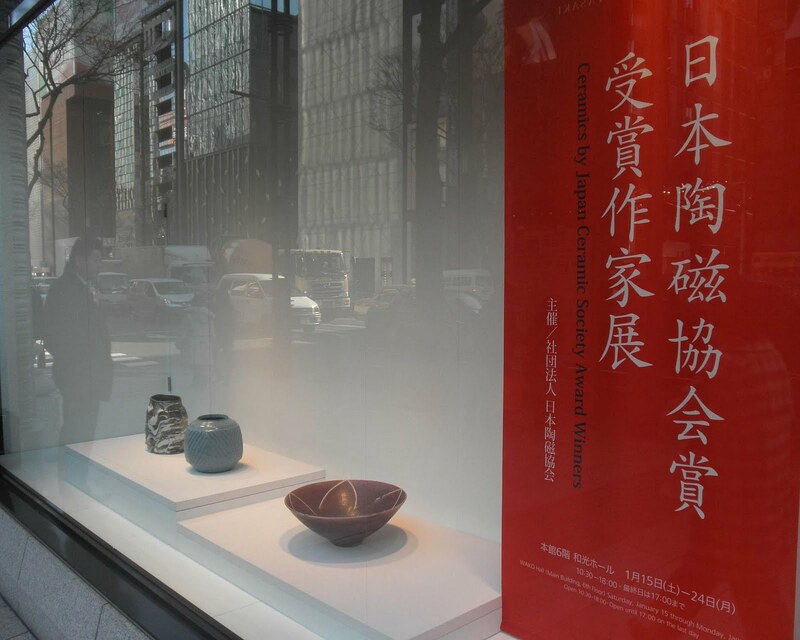 Yesterday (Jan.20th) I was up in Tokyo for my hatsu (first)-visit of the Year of The Rabbit to attend an auction and also to see the yearly Japan Ceramic Society Award-Winners exhibition held each year at Wako in the Ginza district. Down on the street they always have a classy window display and this year it showed the works of Takenaka Ko, Nakajima Hiroshi and the only work by Yasuda Zenko, wonder why they had it there and not in the sixth floor gallery? 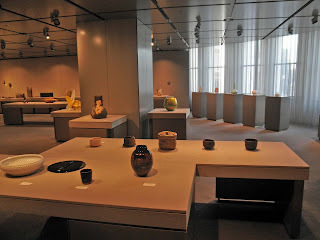 No matter, I asked the price of the Yasuda and an assistant told me he wasn't selling it, ok. Prices were standard for these artists with pieces starting at less then 20,000 yen (some sake cups) and going up to 4.2 million for a large Imai Masayuki work, seen in one of the photos. 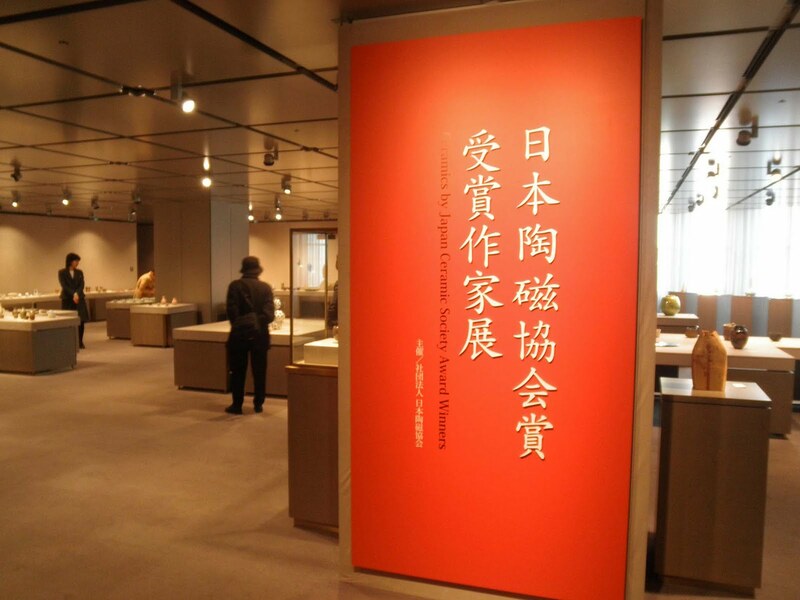 As good and varied as this exhibition is each year, I don't think the artists always send their best works and some even view it, so I've heard, as giri or a type of obligation. Mihara Ken seemed to be the favorite selling one medium work and a whole bunch of sake cups, not many red tags for others though, although Kakurezaki had his large work reserved. 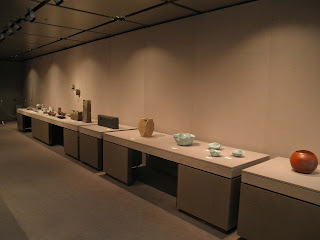 Suzuki Goro had a chawan in a square form he called stone-firing and it felt like a boulder in the hands, how anyone could use it is beyond me! Even a JCS official said WTF is this?! 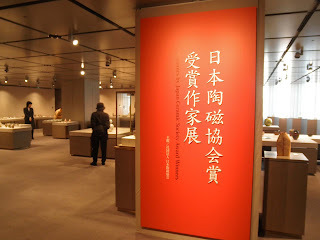 Anyway, hope you enjoy a brief look at the exhibition and hope to see you there next year; we discussed having an English lecture on 2012 exhibition, be my guest! 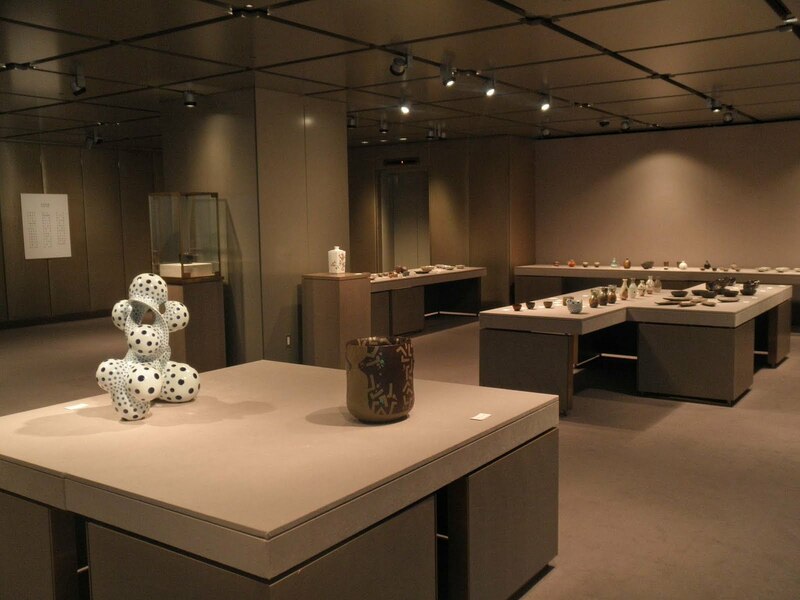 In Tokyo now at Wako, Ginza is the yearly exhibition of past winners of the prestigious Japan Ceramic Society Prize and Gold Prize until Jan.24th. 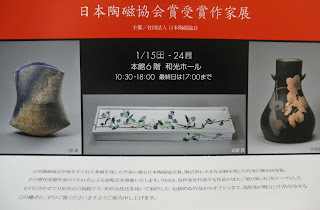 I'll be going tomorrow and hopefully will have some photos to show. All in all 41 of Japan's finest are showing for a total of about 100 pieces; the announcement card cover shows the works of Living National Treasure Kato Kozo (Setoguro chawan), fanciful figures on a gosu box by Kyoto veteran Fujihira Shin, and an organic-ripe aka-dobe Tamba jar by the ever-talented Ichino Masahiko. 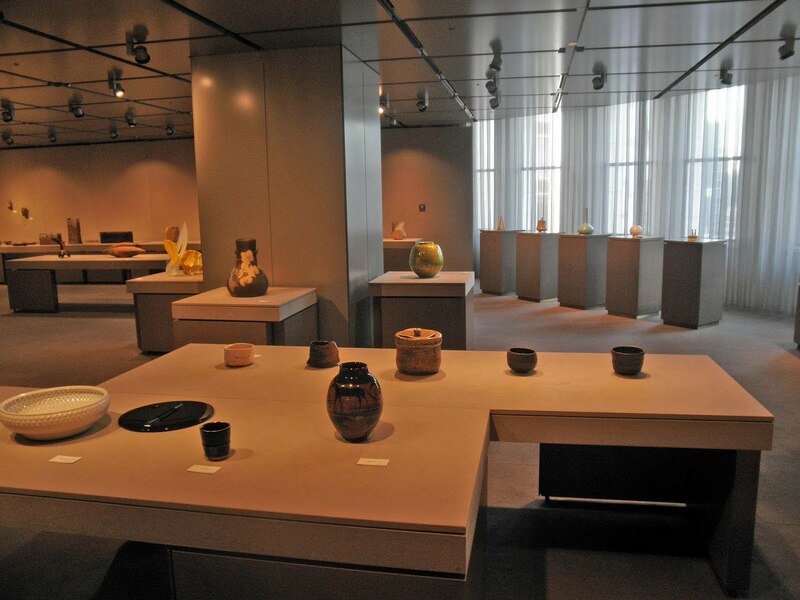 Can you guess the others?